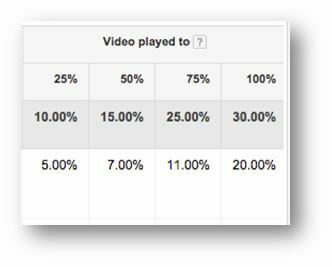 This suite of metrics applies only to YouTube Video campaigns and will be shown if you select a YouTube video campaign within AdWords. Because TrueView ads are powerful ads often used to drive brand awareness. They are billed for in a unique way, using ‘Views’ and consequently Google provide a set of metrics to help you understand your video ads performance. 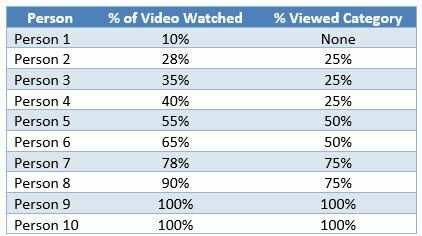 Firstly, the percentages (25%, 50%, 75%, 100%) are triggered once a viewer watches at least 25% of a video (or 50% or 75% or 100%). So for example if someone watched 32% of a video they will fall into the 25% category, or if someone watches 60% of a video they will fall into the 50% category. Each cell in the ‘number column of the above table multiplies the cell to the left by 10,000 to get the number of views each group received. Using this data you can optimise your videos to perform better and reach more of your target audience. You can also review the Video Ad content, if for example you find that most people do not get past 25% of a 30 second ad, you may need to review the first 7.5 seconds of the ad to see if you can make it more compelling to users. You can also use this data to look at what targeting options, ad groups, campaigns, ads etc are performing better and find new niches to expand your budget into. Depending on the length of the video ad, you will be charged when one of the above conditions are met first. You will often find that the 100% ‘Video Played to’ metric is very close to the total views unless your video ads are longer than 30 seconds.